MAMBI MONM-01 - In love with all things mini! if you are looking to add a few more months to your mini planner, this 6-month extension pack is the answer. Plan a happy life if you are looking to add a few more months to your mini planner, this 6-month extension pack is the answer. Each package includes 6 pre-punched dividers; 6 months of pre-punched, non-dated monthly and Weekly calendars; and 2 sticker sheets with months and numbers to help you customize your pages. Plan a Happy Life. Each package contains 38 sheets, including 6 pre-punched dividers; 6 months of pre-punched, non-dated monthly and Weekly calendars; and 2 sticker sheets with months and numbers to help you customize your pages. MAMBI FILM-01 - Are you a list makers note taker how about a doodler pack of filler paper is just for you! each package includes 40 sheets of pre-punched; double sided paper; 20 sheets of graph paper; and 20 sheets of lined note paper. Customize your mini happy planner by adding these handy pages wherever you want them This pack of filler paper is perfect for list makers, note takers, and doodlers. Customize your mini Happy planner by adding these handy pages wherever you want them. Each package includes 40 sheets of pre-punched; double sided paper; 20 sheets of graph paper; and 20 sheets of lined note paper. me & my BIG ideas MONM-03 - Each package includes 40 sheets of pre-punched; double sided paper; 20 sheets of graph paper; and 20 sheets of lined note paper. Each package includes six months of undated planner sheets. Customize your mini Happy planner by adding these handy pages wherever you want them. Budget worksheets. Expense trackers. Keep track of your finances in your happy planner®…and those Cute designs don’t hurt! This pack of filler paper is perfect for list makers, note takers, and doodlers. Bill pay checklists. Budget reviews. MAMBI pldm-01 - Mini dashboards are the answer to helping you land the perfect spot for your sticky notes or other temporary items. Budget worksheets. This pack of filler paper is perfect for list makers, note takers, and doodlers. Dashboard colors are 1 clear, 1 pink, and 1 teal. Bill pay checklists. Also includes 1 clear sticker sheet to help you personalize your dashboards. Each package includes six months of undated planner sheets. Budget reviews. Customize your mini Happy planner by adding these handy pages wherever you want them. Each package includes 40 sheets of pre-punched; double sided paper; 20 sheets of graph paper; and 20 sheets of lined note paper. Each package includes 3 translucent, pre-punched, tabbed dashboards. me & my BIG ideas The Happy Planner Mini Dashboard Classic, 21 pieces - In love with all things mini! looking for the perfect landing spot for your sticky notes or other temporary items mini dashboards are the answer! each package includes 3 translucent, 1 pink, pre-punched, tabbed dashboards 1 clear, 1 teal and 1 clear sticker sheet to help you personalize your dashboards. MAMBI FOLM-01 - Budget reviews. Budget worksheets. Plan a happy life this pack of filler paper is perfect for list makers, note takers, and doodlers. Keep receipts, stamps, invitations, bills, photos and more in these handy pockets. Each package includes 5 pre-punched, designer pocket folders. Each package includes 3 translucent, pre-punched, tabbed dashboards. Each package includes 40 sheets of pre-punched; double sided paper; 20 sheets of graph paper; and 20 sheets of lined note paper. Also includes 1 clear sticker sheet to help you personalize your dashboards. Customize your mini Happy planner by adding these handy pages wherever you want them. Each package includes six months of undated planner sheets. Me & My Big Ideas The Happy Planner Mini Embellished Folders Multi Dots - Pocket folders are the perfect addition to your mini Happy planner. Pocket folders are the perfect addition to your mini happy planner! keep receipts, bills, stamps, invitations, photos and more in these handy pockets. Expense trackers. Mini dashboards are the answer to helping you land the perfect spot for your sticky notes or other temporary items. Dashboard colors are 1 clear, 1 pink, and 1 teal. Bill pay checklists. MAMBI - 6 pre-punched dividers 6 months of pre-punched, undated monthly calendars 1 sticker sheet with months and numbers to help you customize your pages and tabs. Bill pay checklists. Customize your mini happy planner by adding these handy pages wherever you want them! This pack of filler paper is perfect for list makers, note takers, and doodlers. Also includes 1 clear sticker sheet to help you personalize your dashboards. Budget worksheets. Budget reviews. This unique extension pack is monthly! included in each month is a monthly layout followed by helpful prompts, daily to-do's, goals and more! If you are looking to add a few more months to your planner, notes, this 6 month extension pack is the answer. me & My Big Ideas Create 365 Mini Notes and Graph Paper & Mini Monthly Extension Pack Set of 2 - Pocket folders are the perfect addition to your mini Happy planner. Keep receipts, stamps, invitations, bills, photos and more in these handy pockets. Each package includes 5 pre-punched, designer pocket folders. Each package includes six months of undated planner sheets. Each package includes 40 sheets of pre-punched; double sided paper; 20 sheets of graph paper; and 20 sheets of lined note paper. Dashboard colors are 1 clear, 1 pink, and 1 teal. Expense trackers. me & my BIG ideas PPSV-42-3048 - Each package includes 3 translucent, pre-punched, tabbed dashboards. Each package includes six months of undated planner sheets. Keep receipts, stamps, bills, invitations, photos and more in these handy pockets. Each package includes 5 pre-punched, designer pocket folders. The happy planner is a customizable, disc-bound planner system that combines your love for creativity with your need for organization. 1, 768 stickers… did you catch that? one-thousand seven hundred and sixty-eight stickers in ONE book! Helping you plan and giving you a boost of confidence along the way! These stickers make it easy for you to customize your Happy Planner, making everyday routines even more FUN. Designed for the mini Happy Planner. me & my BIG ideas PPSV-42-3048"The Happy Planner" Value Pack Stickers Mini Basics - Dashboard colors are 1 clear, 1 pink, and 1 teal. Also includes 1 clear sticker sheet to help you personalize your dashboards. This pack of filler paper is perfect for list makers, note takers, and doodlers. Bill pay checklists. Customize your mini Happy planner by adding these handy pages wherever you want them. Doodle or jot down things with these handy fill papers for your Mini Happy Planner. 30 sheets of stickers designed specifically for your Happy Planner featuring foil designs. Pocket folders are the perfect addition to your mini Happy planner. MAMBI ALPS-04 - Each package includes 40 sheets of pre-punched; double sided paper; 20 sheets of graph paper; and 20 sheets of lined note paper. Pocket folders are the perfect addition to your mini Happy planner. Each package includes 3 translucent, pre-punched, tabbed dashboards. You are getting 1 pack of Mini Monthly Extension Pack 6 Months Extension.
. The happy planner is a customizable, disc-bound planner system that combines your love for creativity with your need for organization. Customize your mini Happy planner by adding these handy pages wherever you want them. Mini dashboards are the answer to helping you land the perfect spot for your sticky notes or other temporary items. Me & My Big Ideas The Happy Planner Mini Page Protector Pocket Sheets - Bill pay checklists. This pack of filler paper is perfect for list makers, note takers, and doodlers. Each package includes six months of undated planner sheets. The addition of the happy planner mini page protectors just made it easier to include photos, pocket cards and more! each package includes 12 pre-punched sheets 6 each of 2 unique layouts that hold 2-inches by 2-inches and 3-inches by 4-inches photos or cards. Dashboard colors are 1 clear, 1 pink, and 1 teal. 30 sheets of stickers designed specifically for your Happy Planner featuring foil designs. Plan a happy life. me & my BIG ideas PPSV-43-3048 - This pack of filler paper is perfect for list makers, note takers, and doodlers. Each package includes 3 translucent, pre-punched, tabbed dashboards. 749 stickers… did you catch that? seven hundred and forty-nine stickers in one book! Helping you plan and giving you a boost of confidence along the way! These stickers make it easy for you to customize your Happy Planner, making everyday routines even more fun. Budget reviews. Expense trackers. Bill pay checklists. Designed for the mini Happy Planner. The happy planner is a customizable, disc-bound planner system that combines your loved for creativity with your need for organization. Plan a Happy life. Budget worksheets. The happy planner is a customizable, disc-bound planner system that combines your love for creativity with your need for organization. me & my BIG ideas The Happy Planner Value Pack Choose Happy Mini 749 stickers - Plan a happy life. Filling your mini happy planner with inspiration is one of the things that makes this system so amazing. The addition of the happy planner mini page protectors just Made it easier to include photos, pocket cards and more. Keep receipts, stamps, invitations, bills, photos and more in these handy pockets. Me & My Big Ideas MAMPPSV3048.32 - The addition of the happy planner mini page protectors just Made it easier to include photos, pocket cards and more. You are getting 1 pack of Mini Monthly Extension Pack 6 Months Extension. Each package includes six months of undated planner sheets. 30 sheets of stickers designed specifically for your Happy Planner featuring foil designs. Expense trackers. Designed for the mini Happy Planner. Fits mini sized Happy Planners. Bill pay checklists. Contains 875 stickers that include tags, labels, pennant Flags, today's goal, days of the week, phone call, captions of busy day, plan on it, and more. Me & my big ideas create 365 is a system that combines your love for creativity with your need for organization. Me & My Big Ideas MAMPPSV3048.32 Create 365 Big Mini Productivity HP Sticker Value Pack - The happy planner is a customizable, disc-bound planner system that combines your loved for creativity with your need for organization. Plan a Happy life. Me & my big ideas create 365 happy Planner Sticker Value Pack Big Mini Productivity. Also includes 1 clear sticker sheet to help you personalize your dashboards. The happy planner is a customizable, disc-bound planner system that combines your love for creativity with your need for organization. Budget worksheets. MAMBI EB-06 - The happy planner is a customizable, disc-bound planner system that combines your loved for creativity with your need for organization. Plan a Happy life. 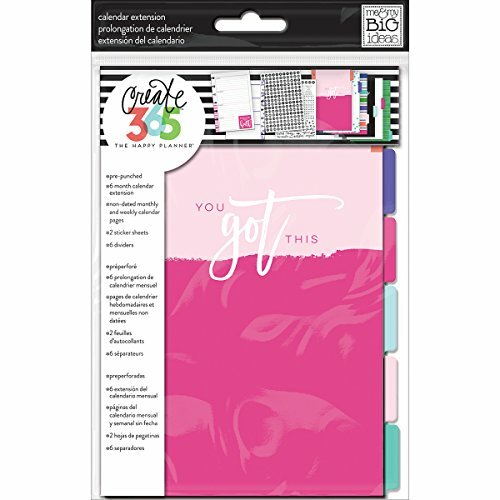 Me & my big ideas create 365 happy Planner Sticker Value Pack Big Mini Productivity. Pocket folders are the perfect addition to your mini Happy planner. Doodle or jot down things with these handy fill papers for your Mini Happy Planner.
. This pack of filler paper is perfect for list makers, note takers, and doodlers. Budget worksheets. The band colors are: 1 pink, 1 black and White stripes, and 1 metallic gold. You are getting 1 pack of Mini Note Fill Paper 40 sheets in total. 30 sheets of stickers designed specifically for your Happy Planner featuring foil designs. me & my BIG ideas EB-06 Create 365 The Happy Planner Elastic Bands, Mini Elastic Bands - Bill pay checklists. Fits mini sized Happy Planners. Keep receipts, invitations, stamps, bills, photos and more in these handy pockets. Each package includes 5 pre-punched, designer pocket folders. Budget reviews. Also includes 1 clear sticker sheet to help you personalize your dashboards.